You probably landed on this blog post because you already use Nimble, or are researching to find the best CRM for G Suite. We use G Suite internally because we absolutely love the simplicity of it, and how easy it is for the entire team to collaborate together. The best part? G Suite works great with our CRM of choice, (surprise!) Nimble. Nimble works alongside you – wherever you work. What does this mean exactly? It means that none of us (yes, not even CRM company employees) live exclusively within their CRM. We are used to responding to our emails in our Gmail, we engage with people on LinkedIn, we create documents and collaborate on them in Google docs, and schedule our calendar activities in Google Calendar. You can use Google Contacts to store your contacts’ information but the problem is that it does not give you the insights and context into the relationship. This is where a CRM comes into the play. 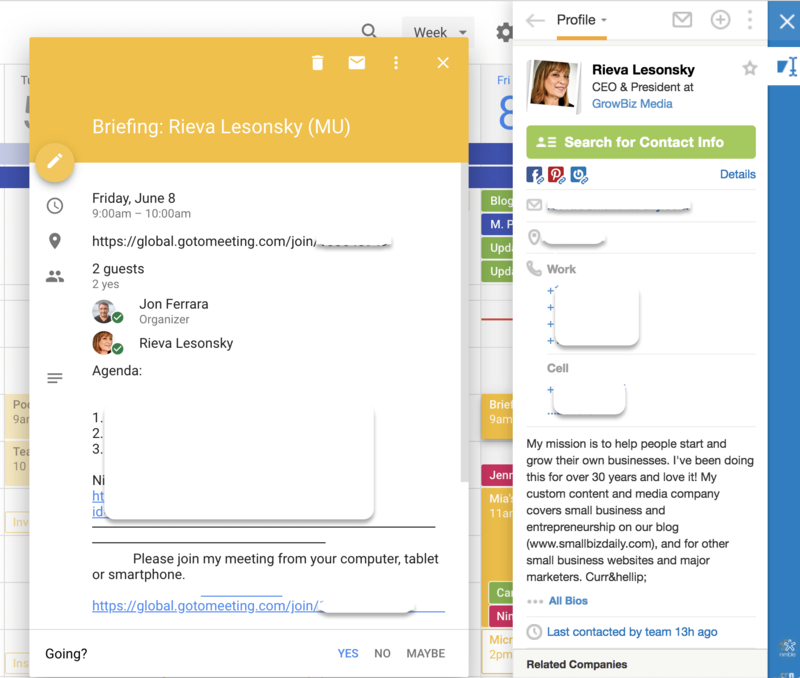 Luckily, it’s super easy to connect all your G Suite apps into Nimble (literally takes a minute or two!). Once you do that, Nimble will automatically link all your calendar activities and your Gmail conversations to your contacts showing you all the information you might need about the person. Additionally, it will also follow you directly into your inbox and everywhere you might be browsing in Chrome. This is really helpful because you no longer have to open another tab, log into your CRM, and log whatever you need to log in there. You simply pull up our browser extension and create notes, add new contacts, update existing records, create deals, add tags and lead details, etc. Since I already mentioned our Chrome extension (which you can download here for free), let’s explore all the cool things you can do with it in this section. How it works: After installing the extension (considering you have already signed up for a Nimble trial or are an existing customer), it will show up next to your other extensions. Once installed, simply click on the icon to open up the plugin. You can use it to hover over any name or a company name anywhere on the internet. 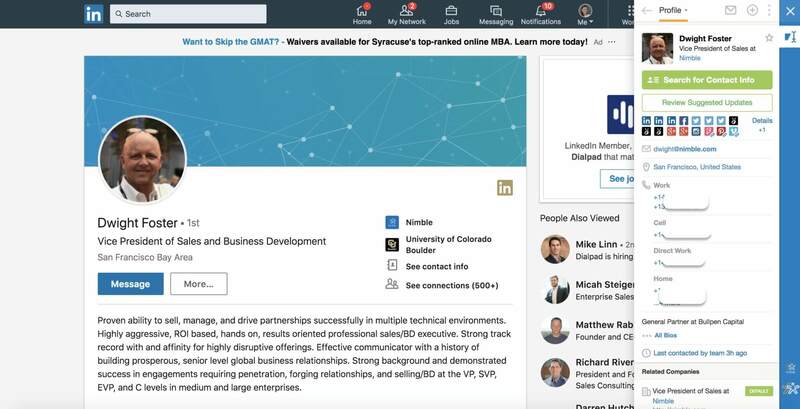 Nimble will either bring up existing records or create “Live Profiles” for people and companies you don’t yet have in your database. This takes seconds and no data entry! Who doesn’t love that? In addition to you being able to easily add notes, create or update deal opportunities, contact info, and log touches, Nimble also allows you to search for people’s contact info. As long as you know their first name, last name, and company domain, Nimble Prospector will find everything else for you! Why you’ll love using the Chrome plugin: Nobody likes to leave where they are working and go log the info into their CRMs. Even though it’s a bad habit, sometimes we might even write critical contact information on a sticky note and then promptly lose it just to avoid toggling tabs. If you have your CRM following you wherever you go, the accuracy of the information in your database will improve significantly. Don’t you just love the simplicity of Gmail? After installing the Nimble Chrome plugin mentioned above, our Gmail widget will automatically load on the right side of each of the email you open. This ability to see instant insights makes it easy to create new contact records and update existing ones. On top of this, our CircleBack integration automatically updates your contact records from people’s signatures. As you can see in the screenshot above, you can also add lead details straight from your Gmail inbox and organize your contacts by applying tags. To make you even more productive and save you more time, we added email tracking and message templates into Gmail! Instead of typing the same thing over and over again, set up templates in Nimble and then easily grab them everytime you need them. 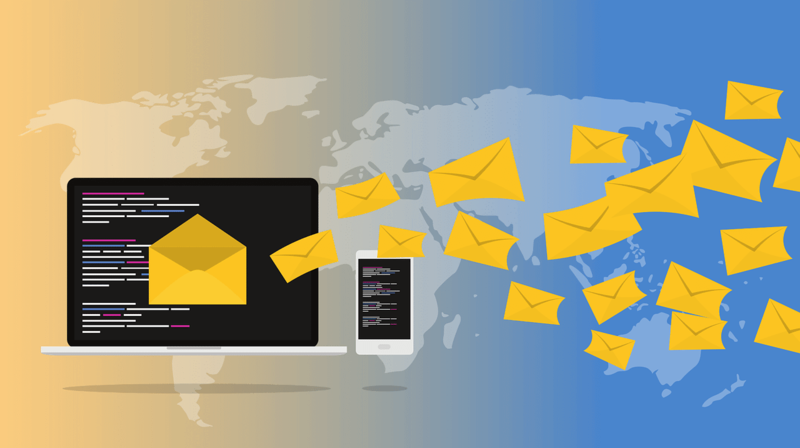 Once you hit send with our tracking enabled, Nimble will notify you when the recipient opens your message and even clicks on the link you included in the email! 3. Google Calendar – Find out Who’s Who & Prep for Meetings in Seconds! Google Calendar is awesome, but do you ever find yourself rushing into a meeting without being completely aware of who the person you are about to be speaking with is, or what their business is all about? If you have the Nimble Chrome extension plugged in, your problem has already been solved. Bring up the Nimble extension, hover over the person’s name in your Google Calendar and use our “never-ending” UI to quickly scan the complete contact record. What are the emails you exchanged? When was the last time you connected? What are they tweeting about? Are there any pending opportunities with this person? Where are they from, where did they go to school and where are they located at this moment? You can find all this info in seconds, making it easy for you to start the conversation right. I have a feeling that most of us spend a lot of time in spreadsheets. They are easy to use and shareable with your team for collaboration and the like. However, sometimes you spend a lot of time on adding information that’s already in your CRM database. You can’t create all the columns you want in your CRM (or at least not so easily), but you can combine these two to save time on data entry. If you are putting together a list of your press targets, you might want to include their titles, the name of the outlet they write for, their contact information, their Twitter handles, and maybe even the number of followers they have on Twitter. Chances are you already have all this info in Nimble. Don’t waste time on double work and focus on engagement and relationship building instead! These are my favorite G Suite/Nimble hacks. 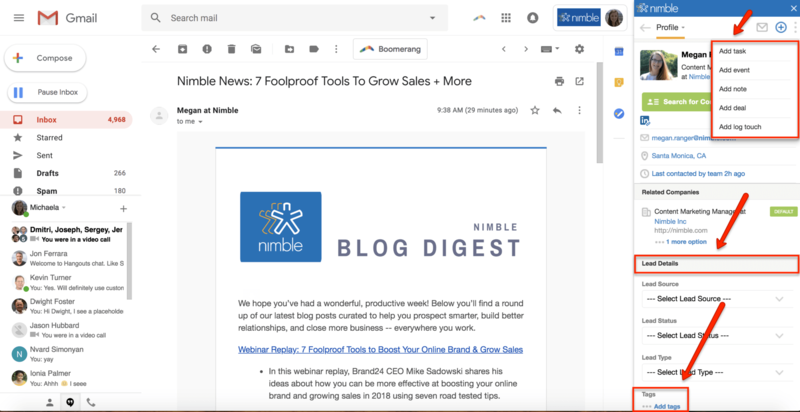 If you have any questions or suggestions for future posts about how to use Nimble with G Suite, let me know on Twitter.